getcalc.com's Buoyant Force Calculator is an online physics tool to calculate the magnitude of opposing or upward force exerted by the fluid acting on immersing object, in both US customary & metric (SI) units. 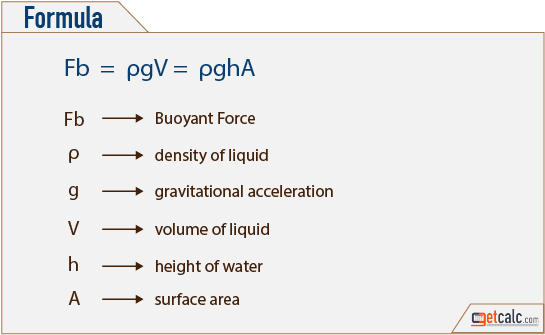 Buoyant Force is a measure of physical quantity that resists the relative force of an immersing object in fluid. It's generally a upward force exerted by the fluid against the force of immersing object.